Get ready drum corps fans! 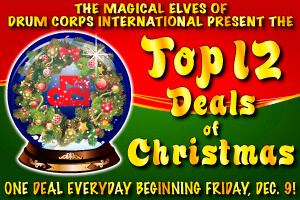 To help give you an edge in your holiday shopping for that special drum corps someone in your life, we're bringing you 12 days of exceptional sales starting at the end of this week. Beginning Friday, Dec. 9, our "Top 12 Deals of Christmas" will feature a different sale item good for one day only and only while supplies last. Check back at store.DCI.org each day at 9 a.m. ET for the latest offer. Visit DCI.org/fans and sign up today for the DCI "Merchandise Alerts" e-mail list to be among the first to know about all of our special promotions and discounts.